I am thrilled to be participating in Burwell General Store’s Recipe Swap for the first time this month. I’ve seen many creative dishes come out of this group in the past and I’m honored to be able to join in! For the swap, everyone had to start with the above recipe for Hot Slaw and make their own version, that is, one that changed/added/deleted some ingredients or maybe tweaked the technique. When I first saw the recipe I thought it sounded oddly appealing. I guess it helps that I like cabbage. It reminded me of a Mexican restaurant’s not-quite-cooked cabbage slaw that my mom and I have always loved. The sweet and sour elements of the dressing were familiar but cooking it into a custard was not. I’ve never actually made custard on the stovetop before. I know, I know, I should really do something about that but this didn’t seem like the right recipe for testing my whisking skills. 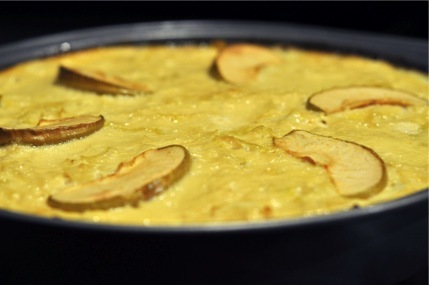 Instead, I thought, why not make a custard with which I’m familiar: a pie. Pumpkin pie is custard, right? That’s how my chain of logic went, anyway. 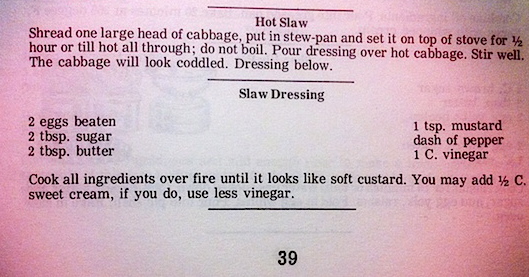 It helped that the recipe gave cooks an option to add cream, which, in my mind, was essential to turning this slaw into a pie. The most difficult thing to decide was how much vinegar to retain in my baked custard. I wasn’t sure if too much vinegar would keep the pie from setting or make it too bitter. I also had a tough time deciding on a crust. I don’t make a lot of pies and mostly steer clear of buttery pie shells. I opted for a crust from a tofu quiche recipe I once made. 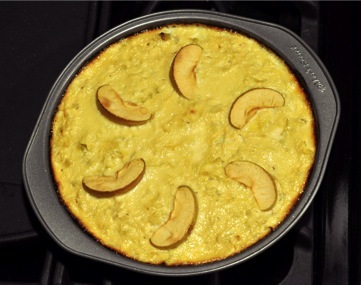 It uses cooked bulgar and made a very nice crust for the quiche. It didn’t turn out quite as well with this pie, however. I think I needed to bake it longer or just go for a regular-old, traditional crust. I could go on about how skeptical my mom, who visited last week, was about turning a slaw into a pie. I reiterate that my husband tries not to eat dairy but tell you that he made an exception in the that department for the sake of pie experimentation. Someone had to help me eat this thing! You get the picture. There’s a lot to say about this pie but I’m going to stop myself and present the recipe before I go on and on. Bring water for bulgar to a boil in a small saucepan. Add grains and cook, covered, on low for 15 minutes, or until all the water is absorbed. Towards the end of the cooking time, preheat oven to 375 degrees F.
When bulgar is cooked, pour it into an oiled pie plate and press it down with your fingers and/or the back of a spoon to for a crust over the bottom and up the edges of the pan. It’s okay if you can’t get it all the way up the edges. Place pie plate in oven and bake for 10-15 minutes, or until the crust is crisp and slightly brown. Meanwhile, add chopped cabbage to a large skillet or saucepan over medium-high heat. Cover and cook, stirring occasionally, until the cabbage is tender. Add chopped apple and nutmeg to cabbage, cook for another couple of minutes, then remove from heat and set aside to cool. In a bowl, beat eggs and add milk, sugar, and vinegar, beating everything together well. Your crust should be out of the oven at this point – pour the cabbage into the pie crust, spreading it evenly throughout the pan. Pour milk mixture over cabbage, distributing it evenly. Place 6-8 apple slices on top of the pie before placing it in the oven. Bake at 375 degrees F for about 45 minutes, or until the center of the pie is set and the top is golden brown. To be honest, I had no idea how this would taste. If it was completely inedible I was going to change some things and make it again. Happily, the pie was more than edible – it was good! The pie was surprisingly sweet, which makes me think more vinegar would be a good idea. The texture and flavor was fantastic, though. It really tasted like slaw in a pie! The apple was a nice addition and I’m glad I added nutmeg, a spice that always pairs well with greens. You may encounter skepticism if you serve this pie to friends and family. Don’t let them deter you! 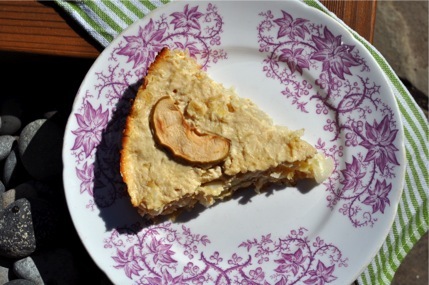 Cabbage pie is a novel, healthy, vegetarian main dish that is perfect for a chilly fall night. Rachel you brave, brave soul you! How ‘out of the box’. Never in 1,000,000 years could I have thought of this! Very innovative. I personally feel this has been the most challenging recipe year. Bravo! Rachel – yay! I’m so glad to see you in the swap, and I hope you had a good time with it! I love seeing how our collective minds work, seeing things similarly at times and very, very different at others. And… bulgur crust; I can’t wait to try this. Thank you so much for letting me join the swap! I’m really looking forward to the next recipe. 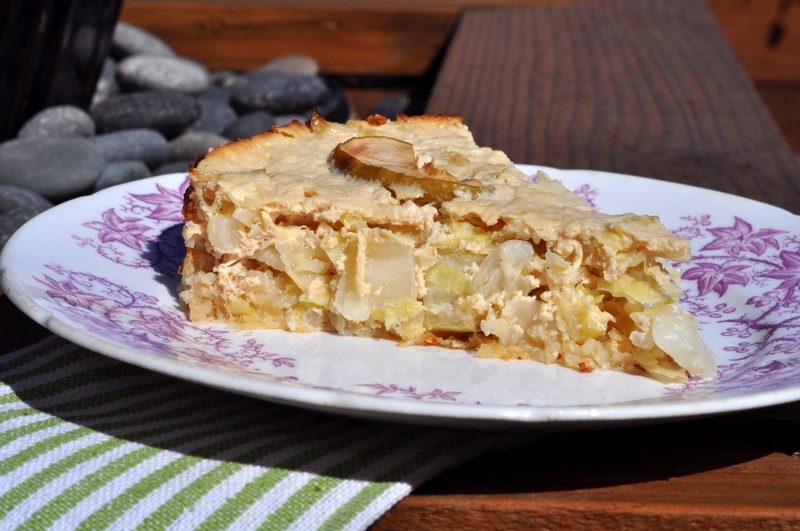 Cabbage pie! Brilliant! That sounds great Rachel and I am sure it tasted great! wow! for your first swap I am totally impressed! great job! can’t wait to see what you make next! Wow, this sounds so fun and wild. I’d love to try it. I’m especially intrigued by the bulgur crust. Great recipe! What an interesting take! That pie looks very very good and creamy i am sure it tastes great! I just love veggie pies – I think this looks great, what a lovely swap. ok, you get a gold star for taking this to another level! Great job with the swap recipe, and I know it was delicious! I think this sounds fabulous…I’ll take your mom’s place, OK. Very unique and delicious take on the original recipe. Well this is certainly new to me! I’m intrigued, I must say. This needs to be tried! Fantastic idea; and I love the bulgar crust! Congrats for braving through this, sounds like the taste worked out quite well. Super swap! Bulgur wheat crust? How awesome! I love pies, quiches and tarts, and this version looks divine. I can only imagine how sweet the cabbage gets when paired with apples. Very creative and inspiring dish! Welcome to the Swap! Thank you! I’m so glad I was able to join in! what a brilliant idea for the crust! I’ll have to try this ASAP. love it. I’ve never seen a pie like this before!! How creative. And I love the sound of that bulgur crust, too bad it didn’t work out as you’d hoped.